The Traveling Tripod: Wireless Internet is now free on Amtrak. Wireless Internet is now free on Amtrak. Thanks to a new service, debuted Monday by Amtrak, you can now surf the Internet while on Amtrak – for free. Traveling photographers can now upload their favorite photos to Flickr or Facebook. With a little luck, traveling photojournalists could now complete their stories and file them with their bureau before they ever get off the train. “AmtrakConnect” is available to every passenger on board Acela Express, both in Business and First class seating. Listening to Lenetta McCampbell, senior director for on-board systems, it sounds like it will expand to other lines in other states as well. “This is only the first step for our AmtrakConnect program,” says McCampbell. 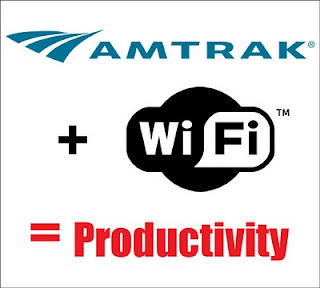 “Amtrak will continually improve the service as Wi-Fi technology evolves, and we are evaluating opportunities to expand AmtrakConnect to additional routes and stations throughout the country.” AmtrakConnect was deployed on Acela Express by Virginia Beach-based GBS Group and its partner Nomad Digital. This promises to be a welcome service for anyone who ever tried to stay connected using the likes of Verizon’s mobile broadband card – which as this writer can attest, was a hit-or-miss proposition most of the time. “AmtrakConnect delivers the fast, reliable and consistent connectivity that our customers have been asking for,” said Matt Hardison, chief, sales distribution and customer service. Time will tell if it lives up to the promise and time will tell if it remains free. According to Amtrak’s press release, the service will continue to be free during this introductory period and they will reassess the situation after they’ve had a chance to analyze its performance and acceptance by the traveling public. When you travel, do you pack a tripod? Great photos = chance to win $170,000 in prizes!